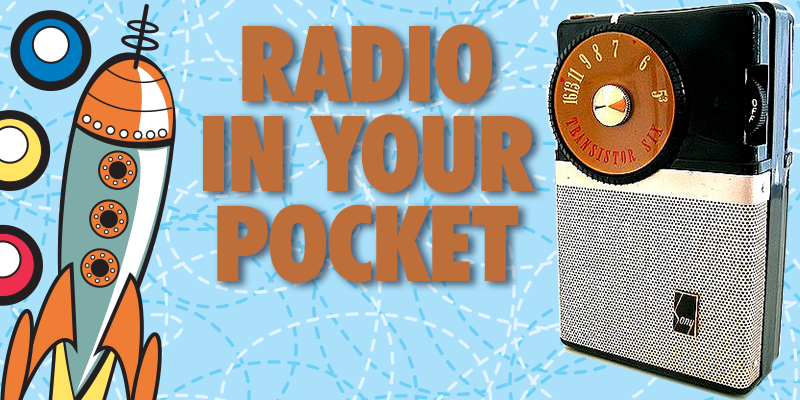 There is little doubt that the portable, battery-powered, “personal” radio was a major player in social change. 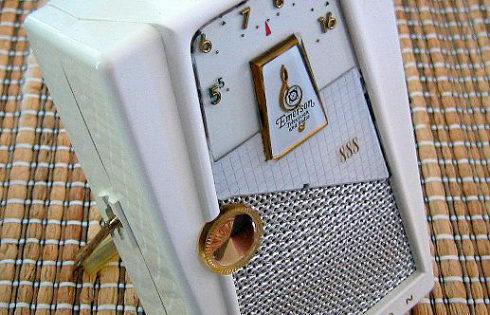 It gave teenagers the opportunity to listen to rock ‘n’ roll music out of the home where their parents could monitor what they heard. 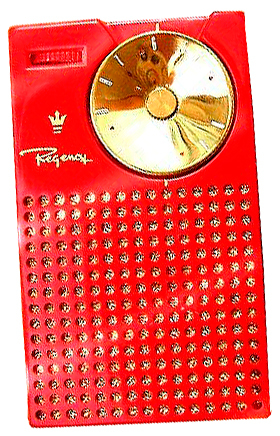 The very first transistor radio sold to the public was the Regency TR-1. It arrived just in time for Christmas of 1954. The TR-1 was a collaboration between Texas Instruments and an Indianapolis, Indiana company, IDEA. IDEA was responsible for creating the look and feel of the case that held the electronics and marketing the new radio. Within one year, 19,000 units were sold at $49.95, less battery. A leather carrying case was available for an additional $3.95, and the “feather-light” earphone was $7.50. 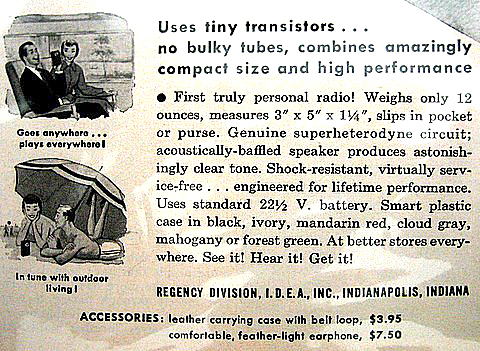 During the following decade scores of radios were manufactured by both American and Japanese companies. Brand name companies like Mitchell, Raytheon, Zenith, Sylvania, GE, Bulova, and Silvertone produced most of the U.S.-made models. One standout was the Emerson 888. 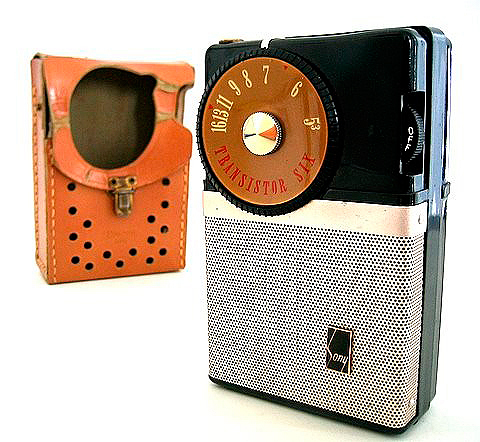 The Emerson 888 Explorer was the first portable pocket radio to have 8 transistors. The manufacturer’s advertising claimed, “Indestructible transistors last for life, never need to be replaced like old-fashioned tubes,” and “Up to 10,000 hours of life on nickel cadmium rechargeable batteries.” But the coolest thing about the 888 was its futuristic design. The model was named after the Explorer-1, the first satellite launched by the United States. The design, with its sleek plastic case, raised gold numerals on the dial face, gold thumbwheel, and silver mesh grill was nothing less than Space Age. Dan, I have a very old transistor radio that I hope I can descride well enough so you can give me some idea of the year it was manufactured.I was in the busuness of selling and servicing radios at the time so I don’t have an invoice. (I’m 89) These measurements are approx. 2 1/2″ wide by 4 1’8″ high by 1 1/4″ deep. No ID anywhere except on the front in the lower left corner is a square with a circle inside with a (looks like)hour-glass inside the circle. Tuning is on left side with vol. on the right. On bottom of back it says “BRITISH CROWN COLONY OF HONG KONG” Hope that is enough!